Our industrial sites and parks have been developed through collaboration between state, city and county governments, private owners and the development board. Union County is a viable, vibrant place to do business. 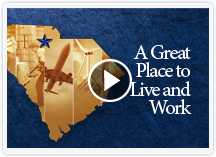 The 164 acre Trakas Industrial Park is a South Carolina Certified Site and it is owned by the County of Union. This park is being developed for large distribution, light assembly, or light manufacturing. With access to Norfolk Southern rail from two points on the front portion of the property, a graded 200,000 square foot pad-ready site allows for flexibility by any tenant.